Summary. Humanity is now the dominant force driving changes of Earth's atmospheric composition and thus future climate (1). 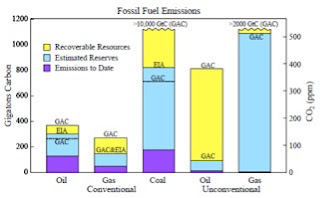 The principal climate forcing is carbon dioxide (CO2) from fossil fuel emissions, much of which will remain in the atmosphere for millennia (1, 2). The climate response to this forcing and society's response to climate change are complicated by the system's inertia, mainly due to the ocean and the ice sheets on Greenland and Antarctica. This inertia causes climate to appear to respond slowly to this human-made forcing, but further long-lasting responses may be locked in. We use Earth’s measured energy imbalance and paleoclimate data, along with simple, accurate representations of the global carbon cycle and temperature, to define emission reductions needed to stabilize climate and avoid potentially disastrous impacts on young people, future generations, and nature. We find that global CO2 emissions reduction of about 6%/year is needed, along with massive reforestation. Governments have recognized the need to limit emissions to avoid dangerous human made climate change, as formalized in the Framework Convention on Climate Change (3), but only a few nations have made substantial progress in reducing emissions. The stark reality (4) is that global emissions are accelerating and new efforts are underway to massively expand fossil fuel extraction, by oil drilling to increasing ocean depths, into the Arctic, and onto environmentally fragile public lands; squeezing of oil from tar sands and tar shale; hydrofracking to expand extraction of natural gas; and increased mining of coal via mechanized longwall mining and mountain-top removal. Failure to achieve the global emissions reduction would have devastating consequences, as climate is nearing critical tipping points that could cause: loss of Arctic sea ice with detrimental effects on wildlife and indigenous people, Antarctic and Greenland ice sheet disintegration with accelerating sea level rise, reduced freshwater supplies for hundreds of millions of people, and a more intense water cycle with stronger droughts and forest fires, but also heavier rains and floods, and stronger storms driven by latent heat, including tropical storms, tornados and thunderstorms. Accelerating climate change is now the greatest threat to the millions of species on Earth, with half or more at risk of extermination. We cannot assign blame for extermination of a specific species on a specific power plant, but the numbers are such that the emissions in the 50-75 years of operation of a large new coal-fired power plant without CO2 capture would be a dagger in the heart of at least dozens of species. Read entire paper at this link (PDF). a NASA Goddard Institute for Space Studies and Columbia University Earth Institute, New York, NY 10025, b Stockholm Environment Institute-US Center, Tufts University, Medford, MA, c Department of Environmental Studies, University of North Carolina at Wilmington, NC, d Global Change Institute, University of Queensland, St. Lucia, Queensland, Australia, e Faculty of Law, University of British Columbia, Canada, f National Religious Coalition on Creation Care, Santa Rosa, CA 95407-6828, g Integrative Biology, University of Texas, Austin, TX, and Marine Institute, University of Plymouth, UK, h Potsdam Institute for Climate Impact Research, Germany, i Stockholm Resilience Center, Stockholm University, Sweden, j School of Ocean and Earth Science, University of Southampton, United Kingdom, k Columbia University Earth Institute, New York, NY 10027, l University of Aberdeen, United Kingdom, m Cooperative Institute for Research in Environmental Sciences, University of Colorado, n Advisory Board, Center for Health and Global Environment, Harvard Medical School, o Centre National de la Recherche Scientifique, LOCEAN, Paris (hosted by Ifremer, Brest), France, p Earth and Planetary Science, University of California at Santa Cruz.